Pages 7-8 from the book "I Create My World"
I painted the collection of whimsical paintings that comprise I Create My World, each with their own characters and interesting story, for a child to interpret using their unlimited imagination. I enjoyed making them, and it was fun and challenging thinking up new and interesting images. After I had collected quite a few, I put them safely under my desk and moved on to other creative pursuits. Fast foward years later when I was working with affirmations from Sanaya Roman's books and also theories of the law of attraction as espoused by Abraham-Hicks. One day, on my early morning walk, I had been repeating affirmations while concentrating on picturing the life I wanted to create. Soon after, I was enjoying the warm water of my morning shower when into my mind popped the words "The paintings under your desk go with those affirmations." I had not been thinking about those paintings and they would still be under my desk to this day except for those words. The ebook "I Create My World" (samples shown below) is the final result of pairing those paintings with affirmations that encapsulate what I've learned in my spiritual studies. Use the book joyously to empower you and your children and encourage them to create their own affirmations and illustrations. Remember to post their paintings around the house! Pages 1-2 from the book "I Create My World"
Pages 11-12 from the book "I Create My World"
Where can I purchase the hardcover version? Where can I purchase the ebook? If you don't have an eReader, you can still read this book on your computer, in vivid color. Just download the Kindle Cloud Reader which is a free download from Amazon. You can then purchase the book from Amazon and read it using the Kindle Cloud Reader software. 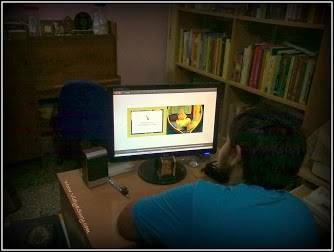 Vidya Sury's 15-year old son reading "I Create My World" on their computer using the Kindle Cloud Reader. 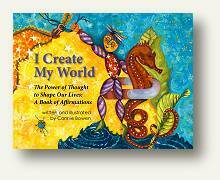 Read Vidya's review of "I Create My World" here on the Natural Parents Network. Turn up your volume . . . . click on the right arrow to move through the presentation after starting. You can zoom and scroll also. If you would like a personalized, autographed copy, please send me an e-mail with your request. The shipping is $4 for Media Mail which takes anywhere from 2-8 days depending on your location. There is a $7 shipping charge for Priority Mail which usually arrives in two days. Let me know how you would like your book shipped to you.